Have you ever been so busy trying to get that perfect Instagram photo while traveling that you actually experienced your entire trip through a smartphone camera? In February, Off the Grid — a company that hosts 10-day smartphone-less international trips for small groups — launched with the goal of helping people unplug and enjoy a well-deserved vacation without technology. Zach Beattie, Off the Grid’s founder, told Thrive Global he quit his job at the online company Mapbox after feeling burnt out. He was inspired to create Off the Grid after hearing his friends also talk about stress and overwork, and his belief in the uniquely restorative power of travel — without the constant distractions of screens, texts and email. “It’s almost like the phone has become an extra body part, and if you don’t have it, it’s like someone chopped it off,” he said. Travel has always been an important part of Beattie’s identity. He and his wife, Sammie, visit a different country every year, and their ultimate goal is to see every country in the world. Since they keep a daily journal when they travel, they’ve seen the benefits of savoring their adventures in ways that don’t involve a phone. “It’s always a blast to read through the memories and relieve each trip,” he said. Beattie admitted that he’s tried to take a smartphone-less trip before, but it’s difficult to “stop a habit on my own.” The process is made much easier with a support system to help you. Last year, Beattie decided the time was finally right for him to turn his dream into reality. With Off the Grid, no one will have their phones out, so being present will be easier, he explained. The company’s first two trips, to Lisbon and Prague, are open for application, and six more options will be made available later this year, Beattie said. When choosing locations, he said he looks for places that are easily walkable, safe and fun for groups. 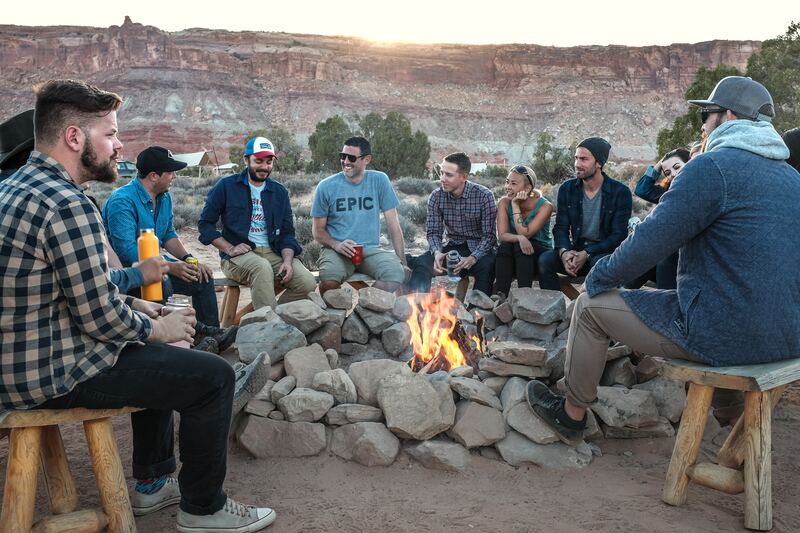 Travelers will live together, kick off the trip with a party to get to know one another and, most importantly, turn off their phones. To cushion the blow of being disconnected from your smartphone for 10 days, Beattie said all travelers will receive a “dumb” phone as a replacement. That way, travelers can still make calls in case of an emergency. Currently, there’s a lot of “pseudo-vacationing” happening where people go on a trip but still answer emails, he said. So his hope for Off the Grid is that it will motivate people to take more tech-free trips to retrain their brains to live without their devices. “The world I want to see is one where you say before you leave: ‘I’m disconnecting and I will not be available. Everything’s going to be okay. The company’s not going to burn down, and when I get back I’ll be able to connect again,’” he said.